alpin & vital Hotel La Perla is an elegant 4 star hotel in Ortisei, the principal town of Val Gardena. Here, right in the middle of the UNESCO World Heritage of the Dolomites, you will be able to enjoy a holiday with a view to some of the world’s most famous mountains. In the summertime, Gardena is the ideal place for mountaineers, hikers and mountain bikers, while in the winter, skiers, snowboarders and winter hikers will find everything they wish for. 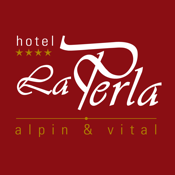 alpin & vital Hotel La Perla will spoil its guests with delicious dishes from the Italian and South Tyrolean cuisine, and you will find wonderful relaxation enjoying our saunas, massages, baths and the great panorama pool. Wellbeing, activity and a unique nature: thanks to our varied offers and included services, alpin & vital Hotel La Perla is the ideal place to be!